When President Obama announced his new war plan for Afghanistan last year, the centerpiece of the strategy — and a big part of the rationale for sending 30,000 additional troops — was to safeguard the Afghan people, provide them with a competent government and win their allegiance. Eight months later, that counterinsurgency strategy has shown little success, as demonstrated by the flagging military and civilian operations in Marja and Kandahar and the spread of Taliban influence in other areas of the country. Our evolving thinking should be showing us that there is still no clearly articulated and shared goal for the US enterprise in Afghanistan. Without that, it’s difficult to say which of these two, or some other approach, does work or to recognize success once it’s achieved. As Andrew Bacevich writes (2010), there’s growing evidence that western way of war itself has failed. Harry Paget Flashman (see book cover above) had difficulty separating fiction from reality in his own exploits in Afghanistan. 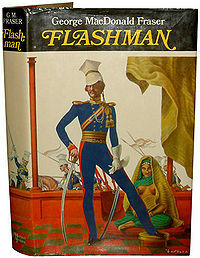 Apparently, reviewers of the Flashman books had the same problem. But we can’t afford to do that any longer in Afghanistan. Bacevich, Andrew (2010, July 29). The end of (military) history? Mother Jones. Cooper, Helene, & Landler, Mark (2010, July 31). Targeted killing is new U.S. focus in Afghanistan. The New York Times. Kaplan, Fred (2009, March 24). CT or COIN? Obama must choose this week between two radically different Afghanistan policies. Slate. Whitman, Alden (1969, July 29). Gen. Sir Harry Flashman and aide con the experts. The New York Times. This entry was posted in Uncategorized and tagged Afghanistan, history, Obama, politics, terrorism, USA, war. Bookmark the permalink. If you haven’t seen it yet, today the BBC posted an interesting column on this issue by Ahmed Rashid: http://www.bbc.co.uk/news/world-us-canada-10825183.